Event Transportation Systems (ETS) takes pride in partnering with our clients to deliver customized, seamless, and reliable transportation services for meetings of any size. We personally manage all of our vehicles and drivers, provide uniformed staff, and create clear and easy-to-read signage for use at each venue. We listen to your needs and deliver solutions that help you meet your goals. We offer competitive pricing and quality products and services because we have over 35-years of relationships with vendors and the expertise in selecting quality vehicles and staff for every client event. And our quotes are clear and all-inclusive, so that our clients are never surprised by hidden fees or on-site escalations. 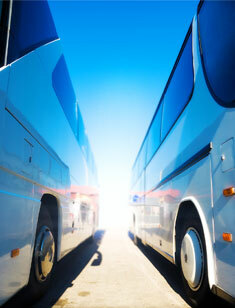 What sets ETS apart from other transportation providers? ETS consistently invests in new technology to provide the best service possible, and is currently developing a proprietary GPS system that will enhance support of on-site route and capacity planning and management. A seasoned account executive is assigned to act as a liaison with the organization to formulate and execute the transportation services. They will be available in advance of the meeting for planning and any required site visit consultation and on-site management. Experienced and trained operations staff are provided to professionally execute the operation of the transportation services. ETS works with local authorities where traffic control is required, and manages the process to obtain any necessary permits and police personnel. Our meeting planners tell us that we “take this major piece of meeting planning off their desks.” And, with ETS as their trusted transportation provider, they are free to concentrate on other critical aspects of their meetings.